Making his presence first known as the boss in Mortal Kombat: Mythologies, Shinnok is one of the most malevolent and sinister beings in the history of the franchise. He was once an Elder God at the time the realms were created, however his lust for power and desire to control Earthrealm would see him fall from grace. Forging an amulet that would allow him to breach Earthrealm, he invaded earth but was thwarted by Raiden. Not accepting defeat, Shinnok was banished to the Netherrealm and became consumed in the darkest of evil. Thanks to the help of Quan Chi, he now sits on the Netherrealm throne after defeating the previous ruler of the realm, Lucifer. With knowledge of sorcery and the dark arts spanning over millions of years, Shinnok is a hotbed of untapped potential and immeasurable power. In Mortal Kombat 4, Tanya allows Shinnok and his minions disguised as refugees sanctuary in the realm of Edenia, she knew exactly who was masquerading as an asylum seeker under the robes. After entering the gates, he cunningly wages a full-scale invasion of the peaceful realm and duels in battle with the Elemental Gods, killing but one of them. He would later succumb to defeat by the champion Liu Kang and scamper back to the Netherrealm to devise his next foray. 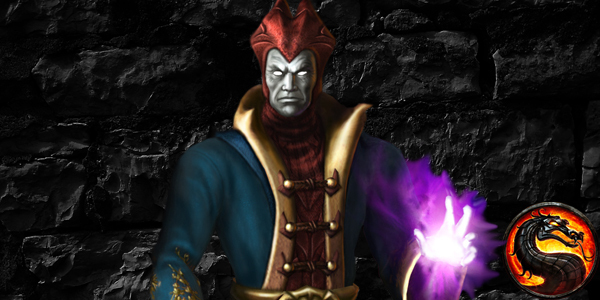 Shinnok gives the impression of a powerful sorcerer, excelling in the knowledge of most magic and arcane arts. He is pale and cloaked in robes with an ornate helmet upon his head. He is in possession of a flawed replica of the amulet he created as Quan Chi kept the original for his own schemes. In Mortal Kombat 4, Shinnok could mimic his opponents fighting ability under his own jurisdiction whilst retaining his own appearance. He was further explored as a master of darkness in Mortal Kombat: Armageddon, using portal rifts and fiendish skeletal hands in kombat. There is a lot that can be done with Shinnok in terms of gameplay, it would certainly be a spectacle to see him use various forms of magic and power during combos and his special moves. Coming into contact with his original amulet would only amplify his power and could spell limitless potential with the character. For those who have completed the story mode in the most recent Mortal Kombat (2011) title, you should be aware that Shinnok seems to be a dead cert to appear in the next instalment, provided it is a sequel/continuation and not a spin-off. A character who can wear the same shoes as Shao Kahn and Onaga, but with an emphasis on magic and not brute force could absolutely be the one character to watch develop in the future. He may have had a rickety ride as the not so threatening boss of Mortal Kombat 4, but with his potential seemingly realised more and more with each game, Shinnok could be the one being to truly pose a threat to the entirety of the Mortal Kombat universe. The elusive 'One Being' for that matter, could find a perfect host within this fallen Elder God... Like this article? Let us know in the comments section below.